Nothing stops Jerry Robinson. Nothing. After graduating as salutatorian in college and landing a job with a global financial company, Robinson continues to do what he knows best—shatter barriers. The budding scholar, born with cerebral palsy, is now pursuing a doctoral degree at Syracuse University’s School of Information Studies (iSchool) and conducting research with the BBI team. It’s an incredible feat for someone who nearly died at birth. “My parents were told I wouldn’t live long, but here I am,” says Robinson, 30, who suffered brain damage after the umbilical cord became wrapped around his head. His parents and doctors didn’t notice the signs of cerebral palsy until Robinson had difficulty walking and talking as a toddler. Even though Robinson sometimes felt marginalized growing up, he learned to thrive off his ability to overcome obstacles. He started in a school for special needs children before moving to one where he was integrated with students of all abilities. “It was difficult because many kids would stay away from me. I just wanted to be accepted and be a friend to others,” he says. Robinson, inspired by an elementary school teacher’s determination to see him succeed, realized education can open a world of opportunities—regardless of the challenges you face. Emboldened by his teacher’s encouragement and armed with his can-do attitude, Robinson became a classroom standout, graduating as salutatorian of his class at Morehouse College in Atlanta. JPMorgan Chase recruited him for its New York City office, where Robinson worked for five years as a human resources data analyst until coming to Syracuse. Robinson is not one to sit still. He has long aspired to earn a doctorate, and he found a perfect fit at SU. “When I first visited the iSchool and BBI, I had a sense that this is somewhere I can grow and be groomed to become a researcher or professor,” he says. After spending years shattering barriers, he is now on his way to helping others follow suit. Robinson collaborates with the BBI research team, putting what he learns in the classroom into practice—with a positive impact for people with disabilities. “It’s one thing to do assignments from a book, but it’s another to actually be able to apply what I learn,” Robinson says. Robinson has conducted literature reviews and data analysis for one of BBI’s projects, the Center on Effective Rehabilitation Technology, to better understand how people with disabilities can obtain and use rehabilitation and assistive technology to increase the quality of their lives, especially through employment. “He’s getting a bird’s eye view and real practical experience in what it means to do applied research—research in action that can lead to measurable impact in people’s lives,” says Meera Adya, BBI director of research. From his experience at BBI grew Robinson’s interest in universal design, an approach that advocates buildings and consumer products be accessible for all people. 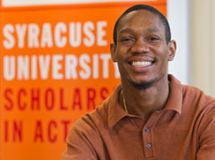 During the summer of 2012, Robinson further developed his research agenda, thanks to a fellowship funded by the iSchool. He plans to investigate how the practices of designers and architects impact people with disabilities. Robinson’s adviser, Murali Venkatesh, iSchool associate professor, describes him as a critical thinker who helps faculty and classmates understand disability from a unique perspective. “Jerry brings clarity in his writing and discussions. He’s also a big thinker—he loves big ideas,” says Venkatesh.